For years, Mercedes-Benz has defined the luxury segment. The name speaks to those who want perfectly fitted leather seats, the latest technology and a drive worthy of a country whose highways rarely see a speed limit. 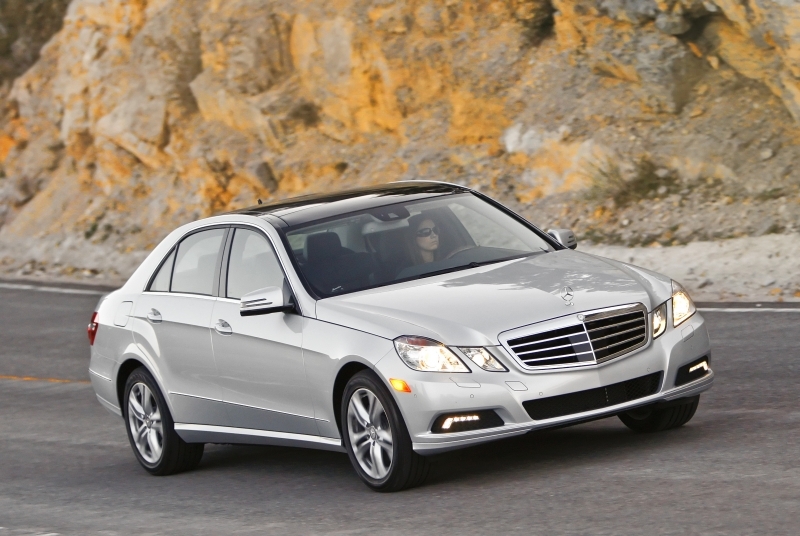 With the new 2010 E-Class sedan, Mercedes-Benz has done it again. The key to its continued success is in the details, more specifically the obsessively perfect details. From gorgeous stitching on the seats to a tiny spoiler on the tail lamps to keep them in pristine condition, every minute detail is covered, meaning that you get to focus on the most important aspect: the drive. The difference between the V-6-powered E350 and the more powerful E550 isn’t as conspicuous as in the coupe, but it’s still significant. We’re sure your id would agree it’s worth the extra $8,000 to get that 382 horsepower. Which brings us to the best part about the new sedan: the reduced price. In one model year, Mercedes has slashed E350 pricing by almost $5,000 to bring it to an attainable $48,600. Yes, the E550 will top $56,000 but the MSRP still undercuts many of its direct competitors. Attainable luxury may have something to do with those 12 million E-Classes they’ve sold in the last 62 years. 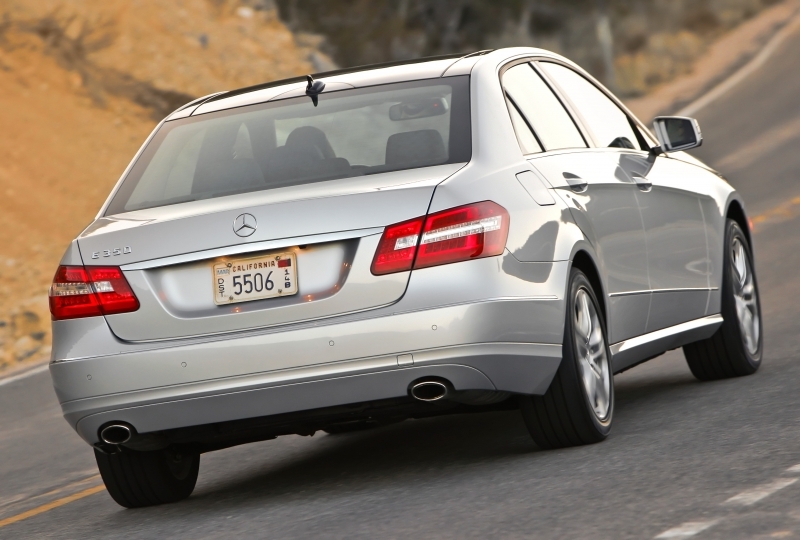 Pricing on the base model is within reach, thanks to Mercedes-Benz’ price reduction program. Cutouts on the backs of the front seats add the needed space for rear occupant comfort. The bucket seats are spacious and well bolstered. Safety systems stay behind the scenes until needed, keeping your drive worry-free. 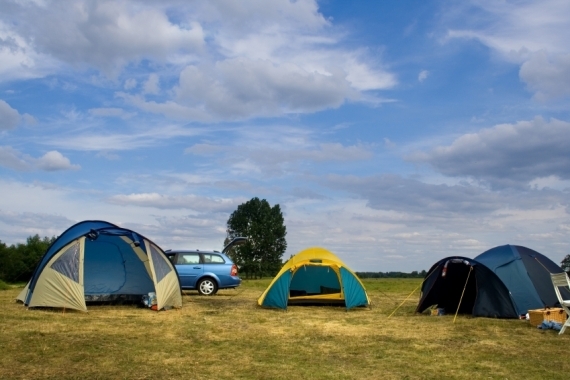 As if that wasn’t enough, Mercedes-Benz offers a 24-hour roadside assistance program as well. The rear end styling isn’t innovative, we didn’t want to say it but Hyundai did it better with the Genesis. The navigation system hasn’t seen an update; it’s not outdated yet, but it may well be by the time the competitors bring their newer wares to the table. The E sedan is a cruiser, as evidenced by its propensity to feel smooth and unworried as it nears triple digit speeds (not that we’d know). It’s hard to unsettle this car in any way; over bumps and around corners the sedan grips the road like a rock climber grabs notches in a cliff, and we’re still trying to find a fault with the steering. Compliant, direct, with no discernable dead spots, it’s exactly how you want a car to steer. As expected, the V-8-powered E550 outshines the 350, delivering almost unending power through the seven gears and having enough on tap to pass at any speed. The V-6 E350 is the statelier of the two, with controlled acceleration and gentle cornering. You’d expect people who own this car to live mainly on the Comfort mode, a setting that sees cushioned suspension and easy starts. Two trim levels, Luxury and Sport, mostly affect the aesthetics of the car, but the Sport trim comes standard with 18-inch wheels. 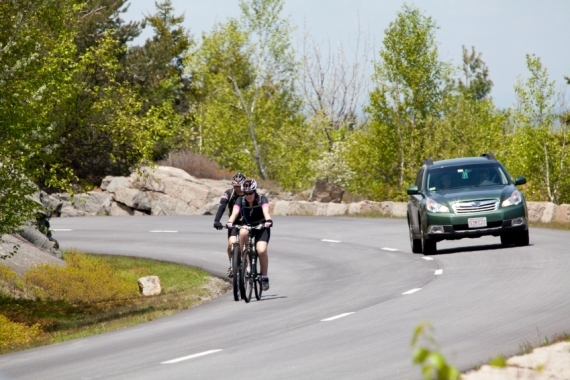 They look great, but the road noise heard through them and the thin tires will intrude into the cabin. All other inconveniences have been nipped in the bud; visibility is surprisingly good for a car that has a dramatically sloped rear window and large rear headrests and four-way lumbar support will hold you at every corner. 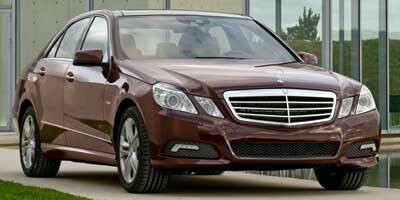 Powered through the rear-wheels, the E-Class sedan has two models, the E350 and E550. The former features a 3.5-liter V-6 engine, producing 268 hp and 258 lb-ft of torque. Petrolheads should opt for the 5.5-liter V-8, an engine that pumps out 382 hp and 391 lb-ft of torque. Each is mated to a seven-speed automatic transmission that has a manual-mode paddle shifter system. The four-wheel drive 4MATIC trim will be out September 2009. Mercedes-Benz has fit so many safety systems into this sedan that you’d probably never know half of them existed – until you have an accident, that is. Standard Attention Assist is the newest, and decidedly coolest, feature of them all. The system maps your driving techniques through steering input to determine if you are too tired to be driving. If that’s the case, it politely tells you that it might be time to pull over. Other potentially life-saving systems include the Night View Assist, which points out barely visible objects on the navi screen, and Blind Spot Assist, which illuminates a warning triangle when a vehicle is in your blind spot and sounds an audible alert if you still attempt to change lanes. The E-Class’ navigation and entertainment control system hasn’t seen any changes to the setup in current Mercedes-Benz models. Its odd format takes a little getting used to, as do the mapping functions, but once you grasp the general idea, using the system isn’t that difficult. 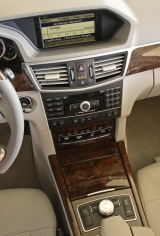 All sedans come standard with excellent iPod connectivity – just stow your player away in the glovebox and control it through the center console. The surround-sound harmon/kardon audio system is worthy of mention as well, bringing deep bass and crystal-clear notes into the cabin. A large luxury sedan with a lot of power has to have the miracles of aerodynamics and long final gears on its side to make up for any savings in gas mileage. The E350 achieves a moderate 18 mpg city, 25 highway, while the E550’s fuel economy retains an excruciating 14 city, 20 highway. Emissions ratings haven’t yet been established. Elegant lines highlighted by walnut or black wood trim and soft leathers are only the start. Lumbar support functions and 14-way power seats make this Benz comfortable for long hauls. Ambient lighting softly illuminates the cabin, and chrome-rimmed gauges stare back at you from the cluster. The shift knob has been moved up to the steering column to make room for two cup holders, a plush armrest and infotainment center controls. The sedan is definitely the coupe’s big brother, besting it by seven inches and 200 lbs., and styling isn’t marked by anything dramatic. By opting for the Sport trim, you’ll get a wider front intake and rectangular tailpipes instead of the oval ones on the Luxury trim. Both get the characteristic four-headlamp setup and a more angular overall look. 17-inch wheels are standard for Luxury models, while 18s can be found on the Sports. As we’ve mentioned before, the E-Class sedan’s price point is a clear winner. Starting at $48,600 for the E350, the car nestles in the ranks with rear-wheel drive contenders like the BMW 535i ($51,100), Cadillac STS V6 ($47,670), Lexus GS 350 ($45,000). The E550 sees competitors like the $60,400 BMW 550i, $60,950 Audi A6 4.2, $57,170 Cadillac STS V8 and $53,470 Lexus GS 460. The 4MATIC, when it comes out in September, will add an extra $2,500 to the MSRP. The E350 and E550 may be different beasts, but the E-Class sedan is exactly what you’d expect from a Mercedes-Benz. It stays firmly on the luxury side of things – even when powered by the V-8 – by keeping the drive neutral and stress-free. Comfort is the primary goal, demonstrated by the nearly tailored-to-fit cabin space and elegant appointments. Not everyone will be looking for a car of this caliber this year, but those who are will do well to start here.